Johann Ludwig Burckhardt decided he wanted to be an explorer. Born in Switzerland in 1784, he was twenty years old when he managed to get himself hired by the Association for Promoting the Discovery of the Interior Parts of Africa. As part of his preparation to explore the western parts of that continent, the Association decided to have him spend two years in Syria preparing for the trip by learning the Arabic language. Burckhardt hoped that if he could master the language and customs there, he might be able to pass himself off as an Arab and avoid the suspicions and mistrust that western visitors to that region often encountered. By 1812 he felt ready to take a three-month journey to Cairo in Egypt, traveling in disguise. While wandering through Jordan, he heard of a wondrous set of ruins only a day's travel off his path and decided to visit it. Knowing that admitting to want to see the location out of mere curiosity would raise the suspicions of his guide that he was not an Arab, he told the guide that he had made a vow to sacrifice at the tomb of Haroun which was situated at the far end of the same valley as the ruins. He planned to see whatever there was to see as he passed by them on the way to do the sacrifice, being careful not to give away his interest by paying too much attention to them. As Burckhardt and his guide approached the ruins the rock walls along the path closed in to form a tiny, twisting canyon at some points only 15 feet wide and hundreds of feet deep. As they continued forward, the end of the gorge appeared and Burckhardt was suddenly confronted with one of the most amazing sights in the world: Embedded in the cliff face in front of him was the intricate and immense fa�ade of a temple carved of the same red rock as the cliffs. The sight was so startling that Burckhardt forgot his part as an Arab pilgrim and entered the strange building, even taking the time to sketch a layout of the interior. As they went along, he saw several more fantastic buildings and entered those as well. It didn't take long for his guide to figure out Burckhardt was no ordinary pilgrim. "I see clearly now that you are an infidel, " the guide told him, "who has some particular business amongst the ruins of your forefathers; but depend on it that we shall not suffer you to take out a single coin of all the treasures hidden therein!" One can hardly blame Burckhardt for forgetting himself. He was seeing something that no European had set eyes on since ancient times and would continue to amaze countless visitors in the centuries to come: the famed lost city of Petra. 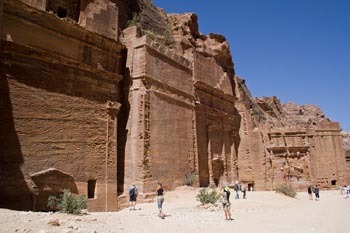 The story of Petra starts with a nomadic people called the Nabataeans who settled the area in the 4th century BC. The land there was mountainous with many valleys and deep canyons. Today, the site of Petra seems to be a foolish place to build a city: it is dry and arid with limited space for farming and houses. In ancient times, however, the area was the crossroads of several important trade routes. Only here could the caravans carrying valuable goods make their way through the high mountain ridges to reach the Red Sea and the Mediterranean. The Nabataeans enforced a toll and provided safe passage for travelers as well as access to water. Soon Petra became their most important city. Commercial traffic to and from Petra increased steadily as caravans (sometimes with as many as a thousand camels) fed the demand for incense, textiles, spices, ivory and precious metals in Rome, Greece and Egypt. During this time the city evolved into a bustling hub of international commerce and culture. Located deep in the mountains, it was easily defensible from surrounding hostile desert raiders that might attack. "This place is exceedingly strong but unwalled�," wrote the Greek historian Diodorus when he visited it. The Nabataean architects cleverly constructed a series of dams, cisterns and pipes to provide the city with much-needed water from a set of natural springs. As the wealth of the area grew, elaborately carved-public buildings were constructed along with gardens and monuments. Along the mountain walls that surrounded the city, impressive tombs were built for the richest families. At the height of its power around 50 AD, 20,000 residents dwelt in the city. A crossroads of trade also meant a crossroads of culture, so that architectural elements found in Petra's buildings showed influence from the Mesopotamian, Egyptian, Greek and Roman civilizations. The Nabataean Kingdom was strong but it could not resist forever the ancient superpower that was Rome. 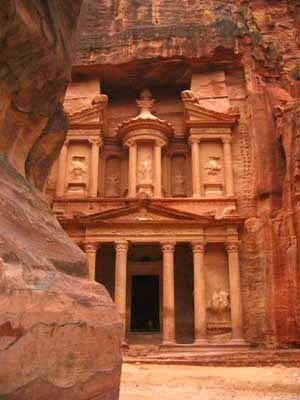 In 106 AD, the Romans took control of Petra, adding it to their vast empire. 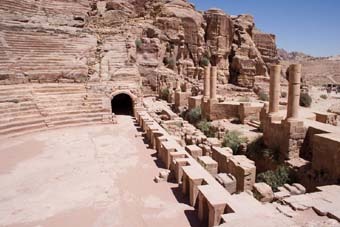 Petra continued to prosper under Roman rule for a time, but as new trade routes opened up, activity at Petra declined. Some of the caravans started moving through Bostra, a city about 165 miles north of Petra in present-day Syria and the Romans eventually made that city the colonial capital. In the 4th century AD, Constantine I became Rome's first Christian emperor. This brought change all across the Roman Empire as the pagan gods were displaced by Christianity. By 350 AD, Petra had its own Christain bishop. Some of the tombs were remodeled as churches and a new cathedral, which boosted colorful mosaics on the walls, floor and ceilings, was built. Petra was located near the boundary of the Arabian tectonic plate and was subject to frequent earthquakes. On May 19th, 363 AD, a very destructive quake hit the area damaging half the city, including the vital water distribution system. Though Petra continued to be inhabited through the next several centuries, the earthquake seems to have hastened its end as an important center of trade and government. Petra's final years remain somewhat of a mystery. The last written records about the city were made by its bishop around 600 AD. When was it abandoned? Some of the records that were found in the cathedral suggest the city still had significant wealth even into the 6th century AD. If that's true, why did people finally leave? Petra has a reputation as a "lost city" but was never really missing to the Bedouin who lived in the area, though they did not refer to it by that name. Today one can visit the city, which is located in Jordan about 90 miles south of Amman, entering it through the same route Burckhardt took in 1812. Visitors walk through the narrow canyon, known as the Siq, to gain entrance to the ancient city. A stream once flowed through this narrow corridor, but the Nabataeans blocked the water with a dam and channeled it through a tunnel, a testament to their hydraulic engineering skills. As the visitor approaches the end of the Siq, he beholds what is probably the most striking structure in Petra, the Khazneh. The name, which means "treasury," comes from a local legend that it hides riches. The story is told that Bedouins at one time believed that the giant urn on the second level of the facade was filled with treasures and they would fire their rifles at it, hoping to break it open. The facade of the building is carved into the rock face and stands over 120 feet high. The building is made even more impressive because of the high cliff walls surrounding the area in front of the building, making it difficult to look at the ancient towering structure from any distance. The way the fascade has been recessed into the cliff has protected the detailed ornamentation on it from much erosion, making the Khazneh one of Petra's best-preserved buildings. Film buffs will recognize the Khazneh as the temple used in the final scenes of Indiana Jones and the Last Crusade. 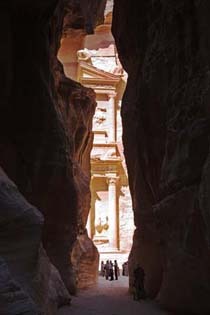 Though in the film the intrepid archeologist searches for the Holy Grail hidden deep inside the temple, the Khazneh and Petra have, in reality, no connection with that legend. The inside of the building is also quite unlike the extensive hollywood sets used in the film. The interior is simply a square room with two small connecting rooms and very little ornamentation. This is typical of most of Petra's tombs: ostentatious on the exterior, much plainer on the inside. After coming out of the Khazneh, visitors can make a left turn and follow the canyon as it widens out into a bowl-shaped area surrounded by high cliffs. This was the center of the ancient city. In its heyday, buildings would have covered the entire basin, but now almost none of the city's freestanding buildings survive. As the canyon opens up the remains of the theatre (probably built in the first century, but enlarged during Roman rule) are on the left. There is also a path here that leads up to the "High Place of Sacrifice" located on a tall ridge which overlooks much of the city. It is here that it is thought that the priests sacrificed animals to the pagan gods before Christianity took hold of Petra. A platform 45 feet wide and 20 feet long, and was said to be originally to be entirely covered with gold, crowns the area, while a sandstone block, carved with channels to carry away the blood, seems to have acted as an alter. From the high place the visitor can observe below the many elaborate tombs for which the city is so famous: the Palace Tomb, the Urn Tomb, Ed-Deir (known also as "the Monastery") and others. Petra has been referred to as "the rose-red city" but from here the visitor can more accurately see that the sandstone of which the city is made ranges from white through salmon pink to brown and deep red. The city remains the focus of much archeological research as scientists attempt to learn more about the ancient Nabataeans who created this unique place. Vandalism and natural erosion have become a recent concern at this ancient wonder and The Petra National Trust is working to preserve this historic treasure for future generation to enjoy. Hopefully with their work, Petra will remain for the next millennia as it has for the last: a beautiful, haunting and mysterious site, reminding us of what life was once like in this ancient land. Petra Rediscovered: The Lost City of the Nabataean Kingdom by Glenn Markoe, Harry N Abrams, 2003. Petra by Jane Taylor, Aurum Press, 2005. Copyright Lee Krystek 2006. All Rights Reserved.